Among the top most Naat Khwans that Pakistan has ever produced, the name of Haji Siddiq Ismail occupies an eminent space. Siddiq Ismail was born on 10th February 1954 in Karachi. He started his career in 1965 through children’s programme named Bachon ki Dunya. Mr. Siddique Ismail holds the honor of being the first ever Naat Khu’wan on PTV. He has performed numerous Naats and is recognized at national and international levels. 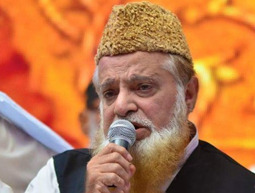 Siddiq Ismail valuable contribution in the field of Naat Khuwani earned him many national and international awards including the most prestigious, the Pride of Performance. Siddiq holds the honor of being the first and also first famous Naat Khu’wan on TV channel. He has recited numbers of Naats and is recognized at national and international levels. Siddiq Ismail has also traveled to many countries and attended Mahfel-e-Milad. He was also known as the best live performer among the all Naat Khu’wan. Siddiq Ismail Naats are known to be popular due to his unique style of narration and melodious heart touching voice. HamariWeb brings you a huge database of Siddiq Ismail Naats 2015 that can be accessed online with ease. You can facilitate from Siddiq Ismail Video Naat and can watch and share it online. We give you an access to free download audio and video Naats in the soulful and melodious voice of Siddiq Ismail. HamariWeb offers you to listen Siddiq Ismail new album online and share it with family and friends. NAAT IS VERY HEART TOUCHING, BUT downloading option is not working.